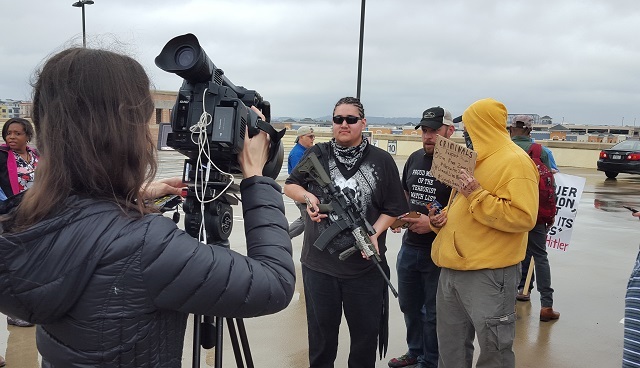 (NaturalNews) TalkNetwork.com and Natural News acquired the exclusive footage of the mock mass shooting that took place in Austin, Texas today as part of a protest against the danger of so-called "gun-free zones." Mirroring the strategy of terrorists and psychotic shooters who strike at random times and places, the Don't Comply gun rights activists unleashed the mock mass shooting several blocks away from the clueless mainstream media, whose easily-distracted reporters spent their time filming "fart protesters" and leftest lunatics waving dildos while claiming the Don't Comply group's freedom of expression was "insensitive." As a result, I broadcast the only footage that was recorded of the actual fake shooting, which took place near 27th and Guadalupe St. Watch it at this link on YouTube. With our exclusive coverage of this event, thanks to Pete Santilli running the broadcast (see youtube below), TalkNetwork.com is the new independent media leader, bringing you live streaming, interviews, photos and broadcasts from important events that affect your liberties. TalkNetwork.com was also mentioned with almost a dozen mainstream media outlets, so we expect a tremendous amount of coverage from the media all this week.